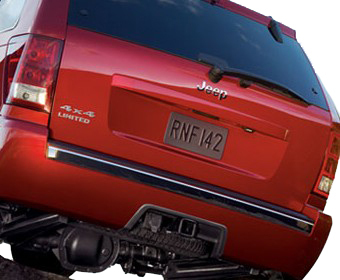 Restore the looks of your 2005 to 2010 Jeep Grand Cherokee WK Limited edition with a new genuine Mopar chrome rear bumper strip. Depending on whether your Grand Cherokee is fitted with the Park Sense system, order the chrome strip with (# 5159095AA) or without (# 5159087AA) holes for the sensors. This chrome rear bumper strip only fits the Limited edition.